It's summer vacation season and many families will be lucky enough to be heading off for at least a few days. At least half of parents say quality time together is the most important reason to take a family vacation, according to a national survey by the rental car company Alamo. Still, there will inevitably be downtime: at airports, on planes, trains or in the backseat. So one new travel necessity is a tablet or smartphone loaded up for the kids with an extra charger or battery. 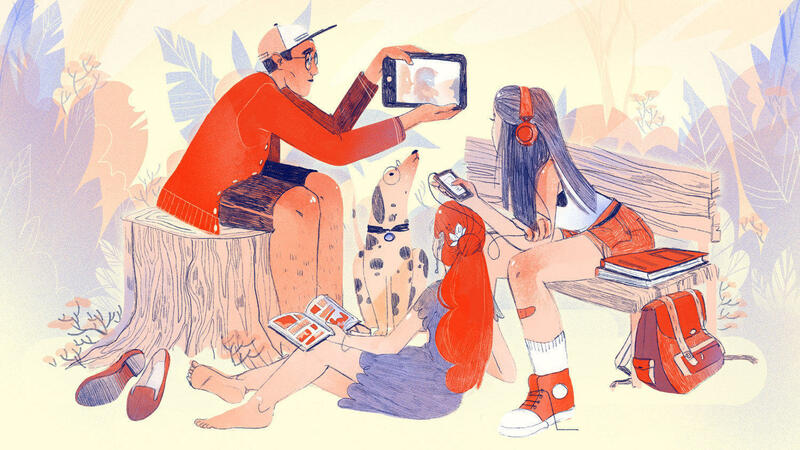 In an ideal world, our kids' screen time won't be a bleeping, blooping, brain-rotting distraction, but a creative and fun, even educational diversion. So NPR Ed reached out to some experts for recommendations and guidelines on helping pick the best apps, for backseat time or any time. These recommendations come with an important caveat. The American Academy of Pediatrics' new guidelines on screen time for kids emphasize the need for balance with other activities. The goal for school-age children is at least 60 minutes of physical activity a day, and meals and other designated family activities should be screen-free time. Joint media use is another best practice that the AAP recommends: That means playing games or watching videos alongside your kids and discussing the content. That said, in a backseat situation, that's not always possible. 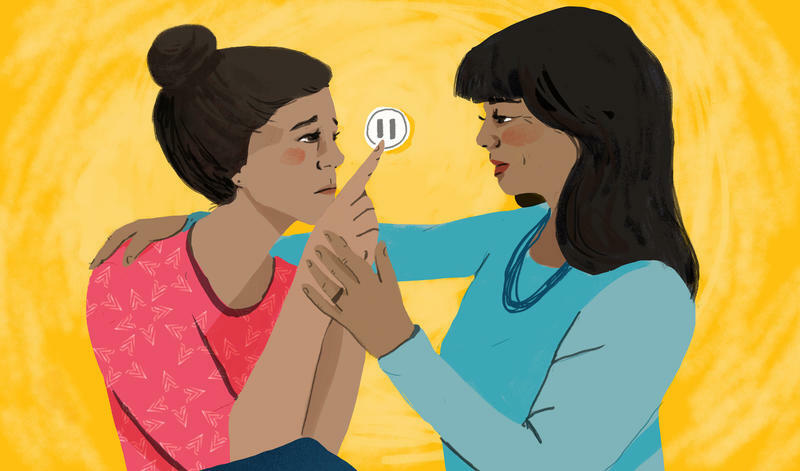 "There are plenty of casual games that will burn time, but ideally parents want something that will help their kids learn also," says Christine Elgersma, who works in parent education for Common Sense Media. The nonprofit provides hundreds of free media reviews to families with information on fun, appropriateness and educational value. So, here are the principles we came up with to guide your children in selecting the perfect apps to while away the time. "Educational" doesn't mean "drill and kill." For the littlest kids, ages 2-5, Elgersma recommends an app called Busy Shapes. "It's puzzle-based and gets increasingly more challenging as kids play," says Elgersma. It's developed by Edoki Academy, which has a group of apps that it says are based on the Montessori method of early childhood education. Montessori emphasizes self-directed and hands-on learning. Even apps that get at specific skills should be more than digital worksheets, says Elgersma, citing e-learning research by Kathy Hirsh-Pasek at Temple University and others. "If the experience can be replicated on paper, it doesn't make sense on an app," Elgersma says. "A great app offers an experience that can only be had on a screen." She points to Motion Math, a group of apps that is being used in elementary school classrooms, and offers fun experiences like running a cupcake shop. Open-ended play is enriching, too. Children, especially young children, have a developmental need to play and use their imaginations. Many of the most worthy apps for kids are better described as "a toy as opposed to a game," in the words of Bjorn Jefferey, the CEO and co-founder of Toca Boca. Toca Boca, one of the most award-winning app companies, is recommended highly by Elgersma. Their first app was Toca Tea Party, basically a play-pretend game, with no points or levels. "It's more similar to Lego," says Jefferey. "You can't win at Lego, it just is what it is." In user testing of the tea party game, one surprising, and fun, change that preschoolers asked for was more spilling. In this category, Elgersma also recommends My Playhome, which is like a digital dollhouse, and Me, by TinyBop, which is a personal scrapbook kids can fill in by answering questions, putting in video and pictures. Try an app that enhances your vacation experience. Headed to an amusement park? Pango Build Park is an app for elementary schoolers that involves building roller coasters and other parts of a theme park — there's a little mapmaking involved too. Going camping? Toca Nature is one of Toca Boca's newest offerings aimed at kids older than age 4. Explore different habitats and get a gentle introduction to the food chain. And, if you prefer old-fashioned, road-trip diversions, there are several free versions of the license plate game available for iPhone and Android, and a wide range of karaoke apps if singalongs are your thing. These can get the whole family involved together. Watch out for ads and add-ons. Some kids' apps are free to play initially, but dangle all kinds of extra goodies that cost money. Earlier this year, Amazon was forced to refund over $70 million in in-app purchases made by children without their parent's knowledge. Apple and Google have had to do the same in years past. Elgersma says to look for apps that have a flat free or subscription model, maybe with a free trial so you can check it out before you commit. The iTunes store now provides a list of in-app purchases, so caveat emptor. Every trip comes with some downtime, whether it's on the plane or the train or in the back seat. Increasingly, one travel necessity for parents and sometimes even grandparents these days is a tablet or a smartphone loaded up for the kids. So how do you choose diversions that will be more than bleeping, buzzing distractions? Anya Kamenetz of the NPR Ed team has been researching this issue for some time, and she joins us now. Welcome to the program. ANYA KAMENETZ, BYLINE: Thanks, Robert. SIEGEL: And backing up a bit, what are the latest recommendations for healthy screen time for kids? KAMENETZ: So the American Academy of Pediatrics updated their recommendations last fall, and they're moving away from an emphasis on hours per day in terms of screen time and toward the idea of joint engagement with media - so to avoid too much solo media use, to make sure that there's a healthy balance with activities. Like, an hour of physical activity per day for kids is recommended. And also, they want to make sure that there's screen-free time in the day, like, for example, family dinner. SIEGEL: But time spent on a long road trip or on a train doesn't allow for a lot of physical activity, so what are guidelines for choosing good apps for travel? KAMENETZ: Well, it has to be something that's engaging and interesting for your kids. And ideally you want something that's not just sucking up time but has learning baked in. And it's important to watch out for apps that don't have a lot of in-app purchases. So something where you pay upfront is a lot less annoying to use. SIEGEL: And I know you've said that some explicitly educational apps may in fact not be the best for learning. Why do you say that? KAMENETZ: Yeah, so there's a paradox here. A vast number of the apps out there that are advertised as being educational are really kind of, like, digital versions of worksheets. That's not really the best for learning. If you can do something on pencil and paper, the experts say, you probably should. And there's no reason to do digital versions of worksheets. You want to have something that is encouraging open play and exploration because, you know, play is really a developmental need for kids. You know, there's apps out there that allow you to have a digital, you know - a digital virtual dollhouse or explore nature and explore the food chain or simply, like, a painting app where you can, you know, have something that's totally open-ended. SIEGEL: ...Really should go by. We've now had a few years. I have grandchildren in this age group who've been playing with smartphones and tablets. Have you heard - is there any research about how this age of kids, this cohort, might be any different from other kids? KAMENETZ: Well, you know, that's really a valuable question. It's worth billions of dollars probably. There are certainly some negative issues that researchers are watching out for, such as addiction, that are cropping up in some vulnerable kids. 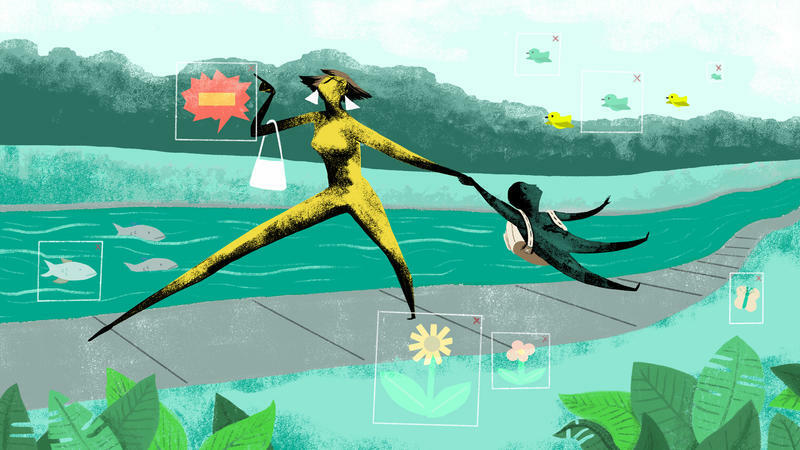 There are some interactions that are being studied between kids that might have trouble self-soothing or have, you know, more problematic behaviors, and their parents might be putting them in front of screens more often. And it's hard to tell where the causal arrow points in that interaction. On the positive side, we have decades of research dating back to the "Sesame Street" years that show that kids can learn quite a bit from educational media, especially when it's appropriate for them, when it's engaging and when there's parents around to kind of direct and encourage creative and expressive and collaborative use. SIEGEL: Any more offbeat ideas for family vacations with a smartphone? KAMENETZ: Yeah, so, you know, it doesn't just have to be all around the app. You can use a smartphone to get kids into traditional things. Like, there's karaoke apps on the iPhone. There's karaoke videos on YouTube. And there's also many different free versions of the license plate game. So you know, can use the phone to keep score while you spot license plates on the road. SIEGEL: That's NPR's Anya Kamenetz. Anya, thanks. (SOUNDBITE OF MINOTAUR SHOCK'S "MY BURR") Transcript provided by NPR, Copyright NPR. 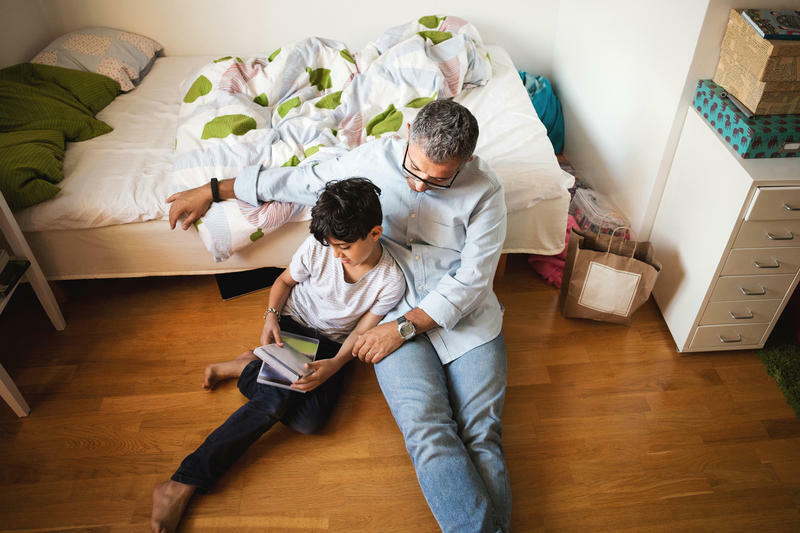 Even though studies show kids whose fathers take an active part in their lives are less disruptive and better adjusted socially, most programs that aim to up parenting skills are geared towards mothers. There are more than 80,000 educational apps in Apple's app store. It seems like a great way to encourage brain development and make your little one the smartest baby genius. But just sticking a tablet in your kid's hands might not be as helpful. Sure, use the app. But it's not a babysitter — you've got to help them use it, too. It's difficult to have a teenager's mind. The brain develops rapidly during the adolescent years, which partially explains why teens experience anger, sadness and frustration so intensely.